If you’ve ever invested in marketing personally or been responsible for a marketing budget as part of your job here’s a scenario you’re likely familiar with. You want to grow the business. You make a plan. You make a budget, get things approved. You scour the internet (probably doing a lot of search engine searching ; ). You hire contractors and consultants. You make some bets on advertising. You try things in digital. You try radio. You try ads in your local press. You try [insert latest marketing buzzword]. It’s a simple and logical question to ask. But can prove to be anything but simple to answer. And we know some really cool things about that $180k. We have solid conversion tracking wired up in Google Analytics. We measure any time someone fills in a form, or calls the business, or interacts with live chat. As result of that measuring we know the cost-per-lead. In this case 2,183 leads for a cost of $82.51 each. It’s great. We know that cost-per-lead by campaign. By keyword. By location. By lead type. We know all these valuable relationships between marketing concepts. It’s tough to keep ignoring—we should talk about it! In 2018 we took this project a step further. We worked with their call center operations and implemented a new call tracking software from calltrackingmetrics.com. And more importantly a new call center process. Call center reps now mark an interaction as a ‘conversion’ if an appointment is booked. This is amazing. We have a new measurement. And it’s further down the funnel, closer to actual revenue—cost-per-appointment. 579 Appointments booked directly as a result of Google Ads, costing $311.79 each. We won an award for “Best Use of Analytics” for the work. Amazing! Wow! Dance of joy! Elephant still present in room. We’re still just inferring…guessing. Informed guesses, using lots of historical and contextual approximations. But still guessing. It’s impossible to avoid the truth sometimes. Many marketers don’t have the stomach look into the void. They hide behind what they do know, what they can measure. It’s not ‘wrong’, necessarily. It’s just—incomplete. Easier, perhaps. And a perfectly understandable survival instinct. Building on these past analytical successes we’re on the verge of doing something really exceptional now. We’re using Tableau to smash data sources together. And the lynchpin—we’re incorporating data from the client’s financial and accounting systems via an API for what we call “Full Funnel ROI Reporting”. That’s right! Top to bottom. We have a year’s worth of data to work with. 1,408 records from Google Ads to be exact. Of those 1,408 people that clicked a Google Ad and then called, or chatted or filled out a contact form on the website we have successfully matched (using a set of unique common identifiers between the two systems) 1,072—76.13%. Pretty close to my hopeful estimate >= 80% match. Oh My, Oh My—We’re About to Know the ROI! The question is starting to look simple again. It’s funny how challenging simple can be. Of those 1,072 people—how much revenue was earned? How does that compare to the $180,110.53 invested? Another few weeks and I’ll have my answer. After over a year’s worth of effort. Whenever I’m talking to potential new clients I always like to share how our intense focus on analytics doesn’t just benefit us as their Google Ads agency. It’s meaningful for all their digital marketing activities. The work that we’re doing with this client will just as easily be able to quantify and measure the actual ROI on their investment in social media or SEO for example. 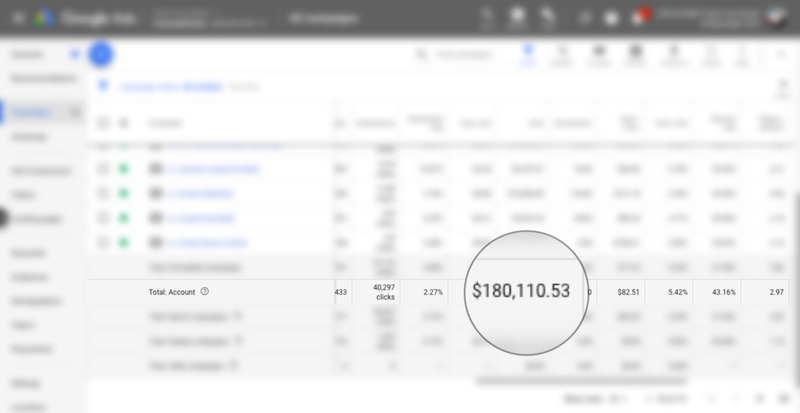 Full funnel ROI reporting is real! Not easy. But absolutely possible.